Hello again, its the weekend at last and the sun is shining. Although I am in the midst of a nasty cold, I have some time and energy to make a card. I do have the usual house chores to do but they can wait a little longer! I have made a thank you card using a beautiful little fairy from Lily of the Valley, her name is Freedom (ref code S225). This is the first time of inking her up since my other half kindly bought her for me at the Farnborough show in February. I have used the excellent sketch created by Bev over at the LOTV Thursday Challenge Blog because I would like to enter this card into this weeks challenge. LOTV are also looking for a Guest Designer chosen by the DT to join them for 4 weeks, so be sure to get your entries in for a chance of being on the DT. Good luck. 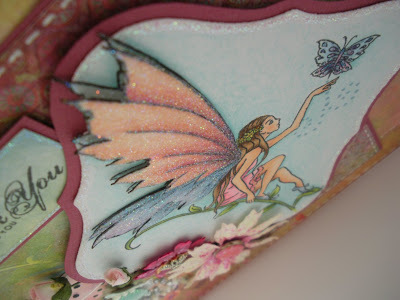 I stamped the fairy's wings a second time so that I could decoupage them to add dimension. They were coloured with Copics and then glittered using a Quickie Glue Pen and Stampendous Ultra Fine Crystal Glitter. 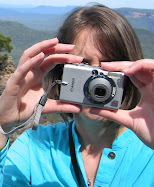 You kind of get the idea from this photo. Butterflies - Martha Stewart punch - coloured with Copics and glittered for bling. The bodies are tiny pearl gems. I adore the image, but your colours in this are breathtaking! Amazing details, gorgeous butterflies and a really fabulous card. Oh Jenny,what a gorgeous card,love what you did with her wings,that briliant! I like your take on the challenge. Beautiful colouring, card, everything. Just Beautiful! Love the coloring and the DP. Thanks for joining us at Little Miss Muffet Stamps.